Once in a while, or more often if you are like me, you will find yourself in need of having some medals mounted for your collection. You could send them out to a professional or you could add to your enjoyment of the hobby by mounting them yourself. There is a certain satisfaction in being able to “do-it-yourself” and the finished project may well surprise you in looking quite professional. 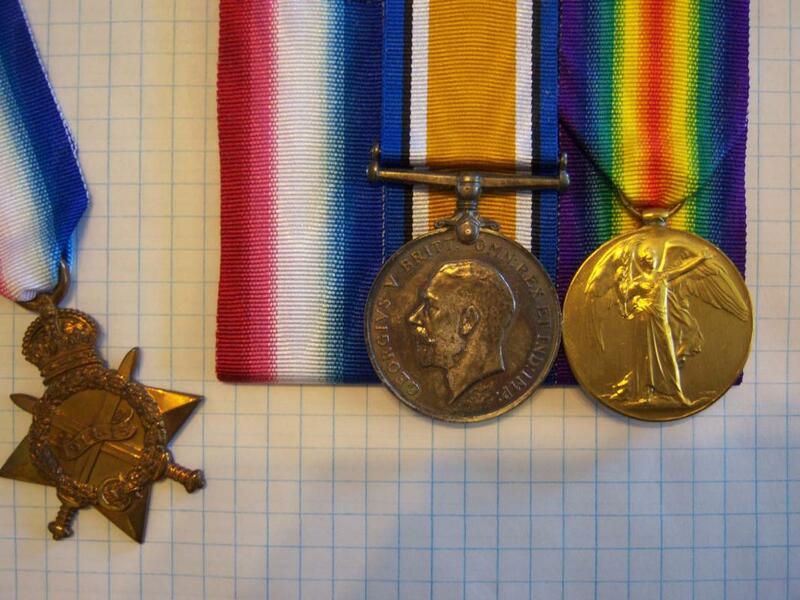 I have mounted groups of medals for friends wanting to preserve their father’s or grandfather’s medals as well as fellow collectors who just can’t be convinced to try this themselves. The one thing I will NOT do is add an attachment pin to the back of the mount unless it is for the veteran who was awarded the group. I will not be part of making it possible to easily wear someone else’s medals. However, I happen to like the way a group sits in a display case with the pin device in place and if I am mounting the group for my own collection I place a small piece of cardboard under the top edge to give it the same look; not affixed to the mount but simply placed under the group. I leave it to you as whether you want to add a mounting pin or not. I’ll point out when this should be done as we proceed. It should also be noted that I do not consider myself a professional and this tutorial is simply meant to give you a few helpful tips and possible encourage you to try this at home yourself. This is the way I do it, there are many other methods. You will need some materials that may require you to make a trip to your local fabric store. Don’t be scared when you walk into this feminine haven, they are as afraid of you as you are of them. Seriously the ladies working at the sewing centres and fabric stores are more than happy to help you find what you need. I’ll discuss these materials at the end of the “materials list”, so here is what you will need. Pelham is a thick starched felt-like material used in hat making and in the old days in the lapels of men’s suit jackets as well as at the top of curtains where the hooks go to hold the curtain to the rod. Years ago there was a material that looked like thick burlap called "Buckram" but it is no longer available here in Canada. They will sell you ½ a metre of this which should keep you going for years. I usually buy at least a metre at a time as I do use it up quite quickly. This is used at the end of the project to cover the back of the finished mount. 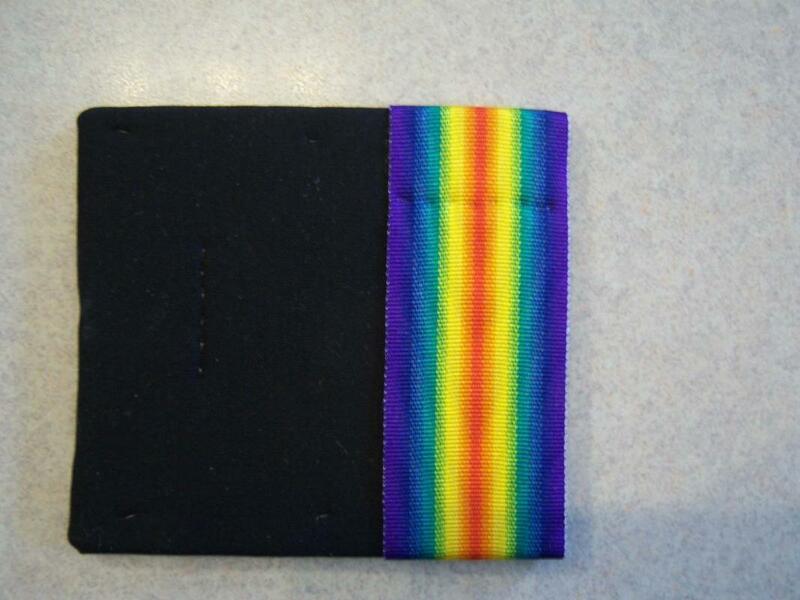 Felt may be purchased in one foot squares and won’t cost you a lot. Again I purchase a couple of metres at a time resulting in a piece of felt 2 metres by 2 metres. You won’t need that much so go for a 1foot X 1 foot piece. 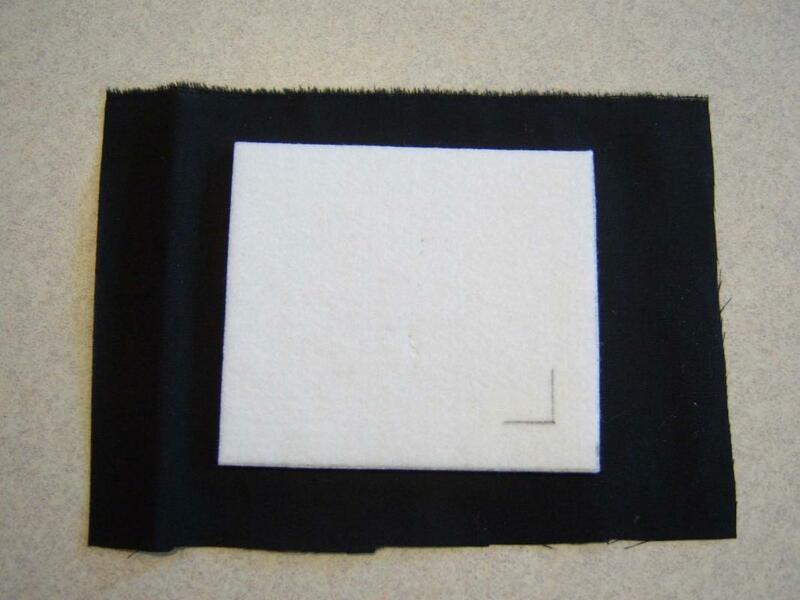 Black cotton broad cloth is easy enough to find and you will only need to purchase a small amount. Again you may have to go for ½ a metre minimum. This goes on right under the medal ribbons and covers the base made from the Pelham, and also makes the ends of the mount black hiding up the white of the pelham; we’ll see this later on. The rest of the materials are pretty clear and can probably be found around most homes. Next we’ll look at making the base for the mount; that is to say to the point where we will start to attach the first layer of ribbons. First cut two pieces of pelhem 3½ inches long and as wide are the ribbons set side by side. 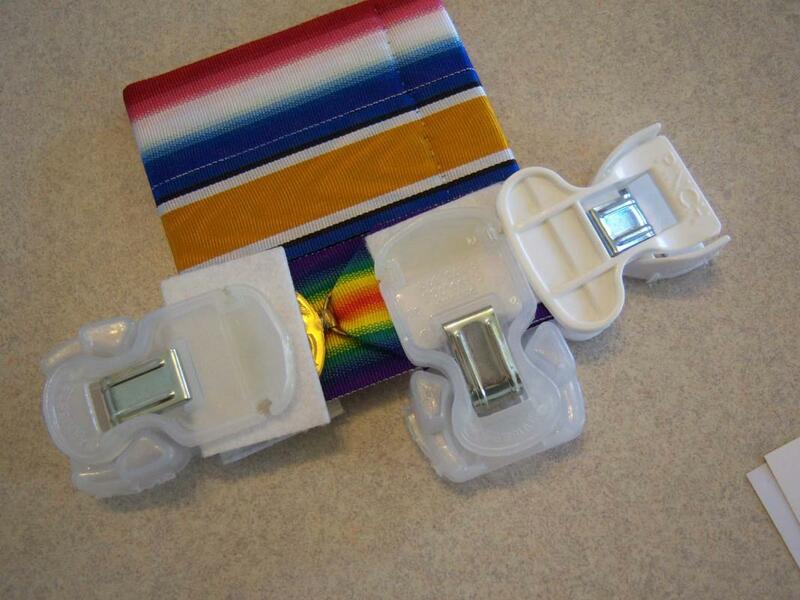 The rule of thumb is 1¼ inches per ribbon; however not all ribbons are the same width so simply set the ribbons on the strip of 3½ pelhem and mark it for cutting. 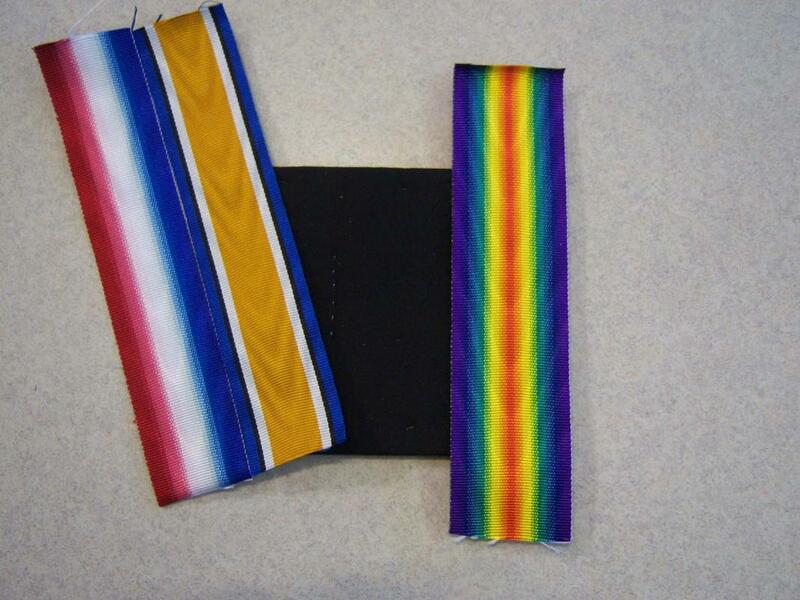 Remember it is better to cut this piece a “whisker” smaller than the width of (in this case) the three ribbons. 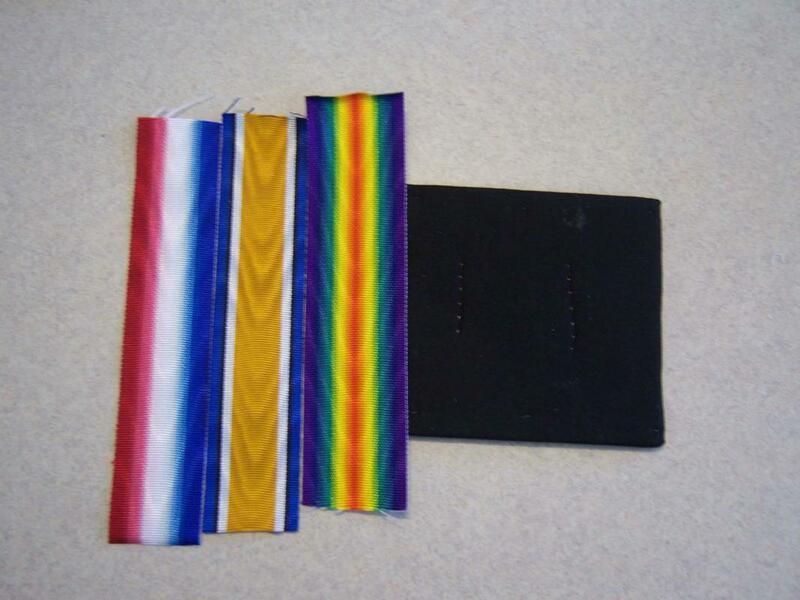 This is because later on you will be adding a piece of black cloth which will wrap around the ends of the white pelhem and if the width is exactly the same as the ribbons you will have a thin black strip at the end of the medal bar. If this happens, and it does, it is not the end of the world; you see it all of the time, even in wear. Let’s hope our example has been cut correctly, otherwise you’ll get to see what this looks like and I will be quite embarrassed. Next glue the two pieces of pelhem together. Since this material comes in a roll at the store there should be a curve to each piece you have cut. Make sure they cup toward each other so the edges won’t want to separate. I placed a weight on these two pieces for an hour or so just so the glue will set up nicely. 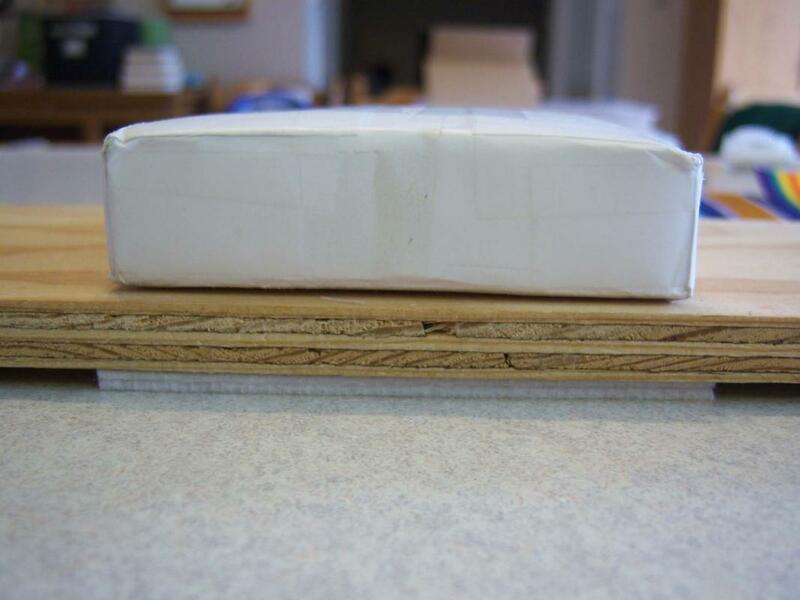 I use a piece of scrap plywood and a scuba diving belt weight made of lead wrapped in paper to keep everything clean. A book on the two pieces with anything for weight will do. Next I always put a stitch of the fine invisible thread; this is actually nylon which I didn’t mention earlier, in the middle of these pieces just to keep the tension on the two cupped halves once the glue has set. I won’t show that as it doesn’t need a photo and instead will move on to the next step. 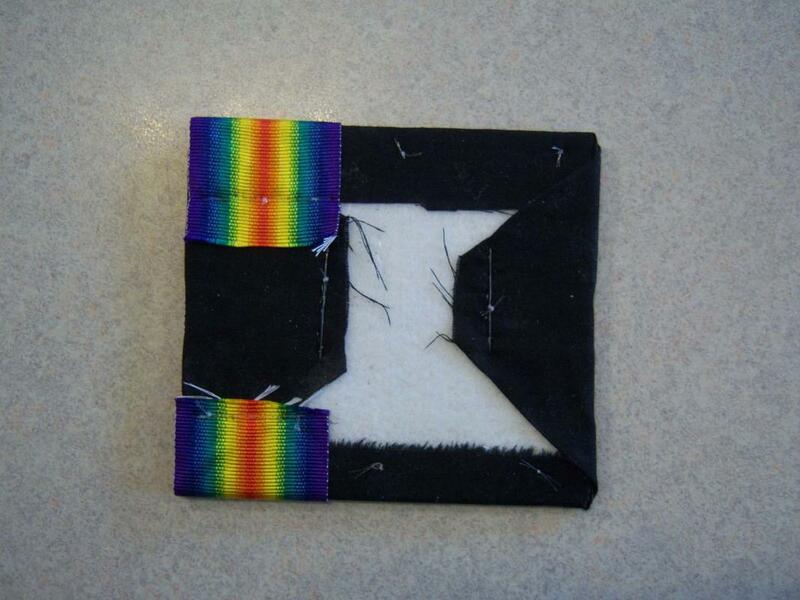 Now we need to attach the black material using glue and some stitches. As I mentioned this black material keeps any space between the medal’s ribbons from showing up as white lines and covers the ends to also prevent the white from showing which would distract from the mount. Cut the black cloth larger than the backing piece that you glued up earlier as shown below. Next glue the top and bottom of the cloth over onto the back. Then place a few stitches along this area to help hold it in place. I made some handy clamps by cutting the devices from some clothes hangers my wife was throwing out. These are really handy when you just have to have that “third hand”. I just place three stitches on each side where the material shows between the clamps. 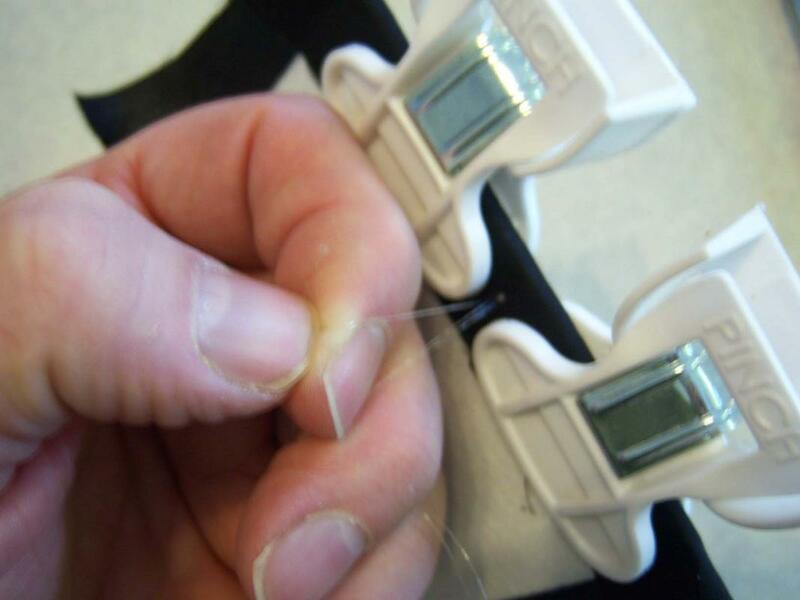 Now the ends need to be brought over and attached using glue and a line of stitches as can be seen below. 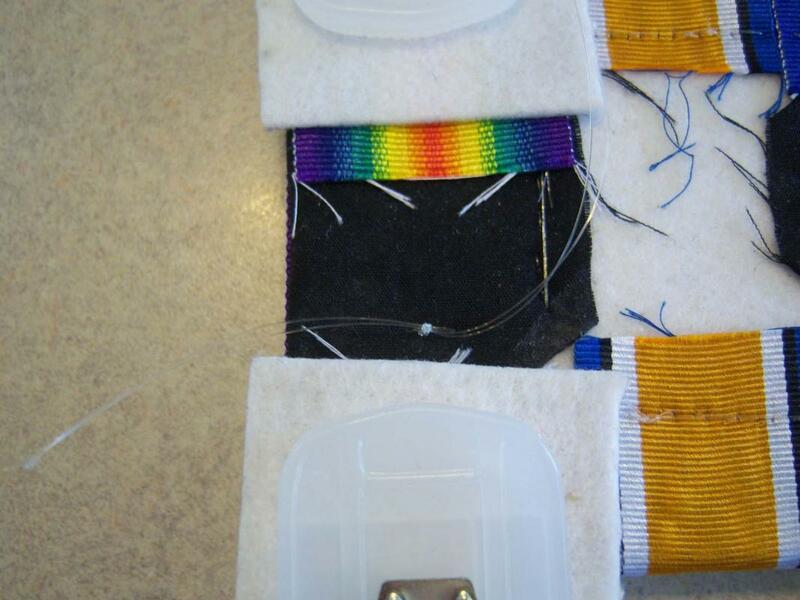 Remember to always start your stitches from the back so that when completed the tired off stitches will be at the back and not leave bumps under the medal ribbons that we will be putting on later. It is at this point where you can mount the pin for attaching the group to a uniform, if that is want you have decided to do. 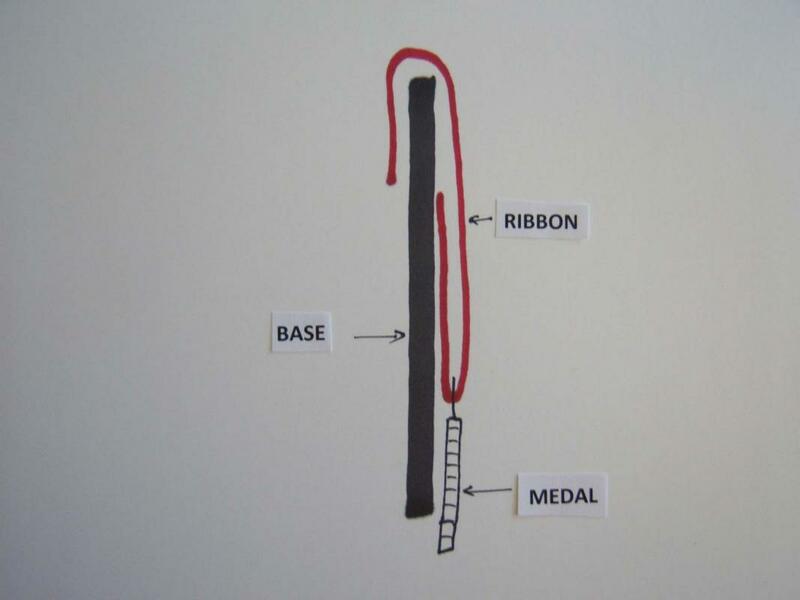 By now you should be ready to start the installation of the base ribbons. First you need to put everything away for the evening, bandage up those fingers you’ve been pricking for the past 1½ hours, take a deep breath and calm down. By now you should be able to figure out why the professionals charge so much to mount a group of medals. Now that you’ve had some time away from the project and your fingers no longer bleed from puncture wounds you are ready to start to put the first layer of ribbons on the base. This is the point where you really need to take care. First make sure your ribbons are going to face the correct way. In our case this is only important for the red, white and blue stripes of the 1914/15 Star. This sounds simple enough but you’d be surprised at how easy it is to get things turned around. Next lay the ribbons on the black base and make sure that there is the same amount of overhang on each of the outer edge ribbons. If there is none, good, but a little overhang can be a good thing as well. If the black base shows on both edges then you really need to start the whole project over again. Believe me I’ve been there. 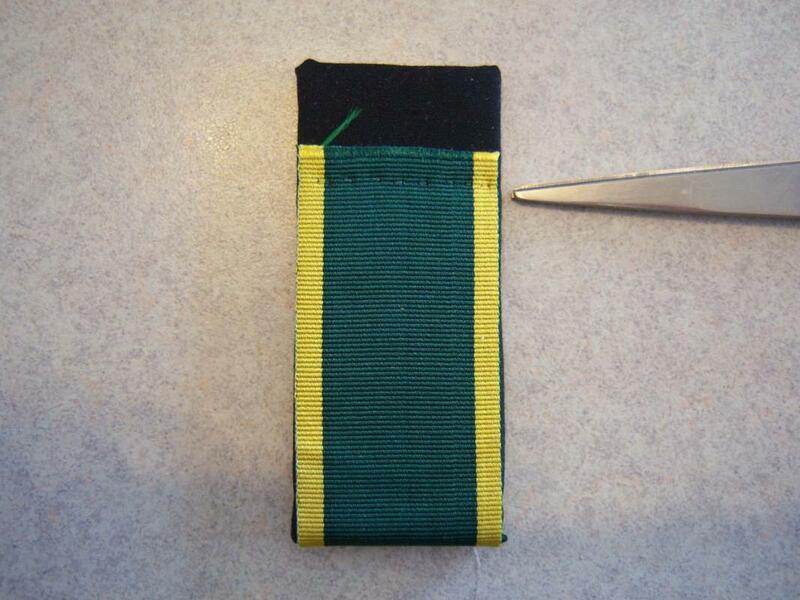 Making sure that the ribbon you want to start with is held in place then you can start to affix them to the base. 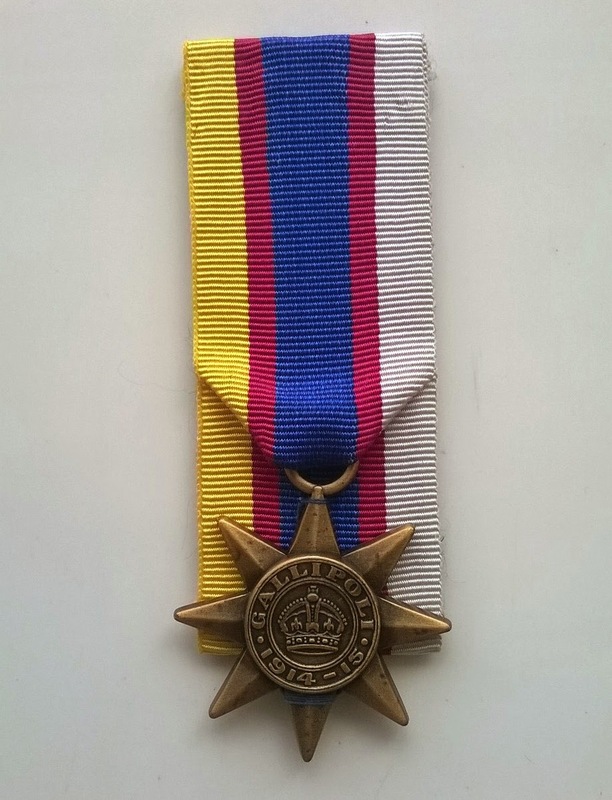 It really doesn’t matter if you start with the right or the left side at this stage; I like to start with the right hand ribbon, in this case the Victory Medal. I like to use the handy little clamps I made to make sure the ribbon will not move during this process. Glue the ribbon to the base starting with the bottom of the ribbon. 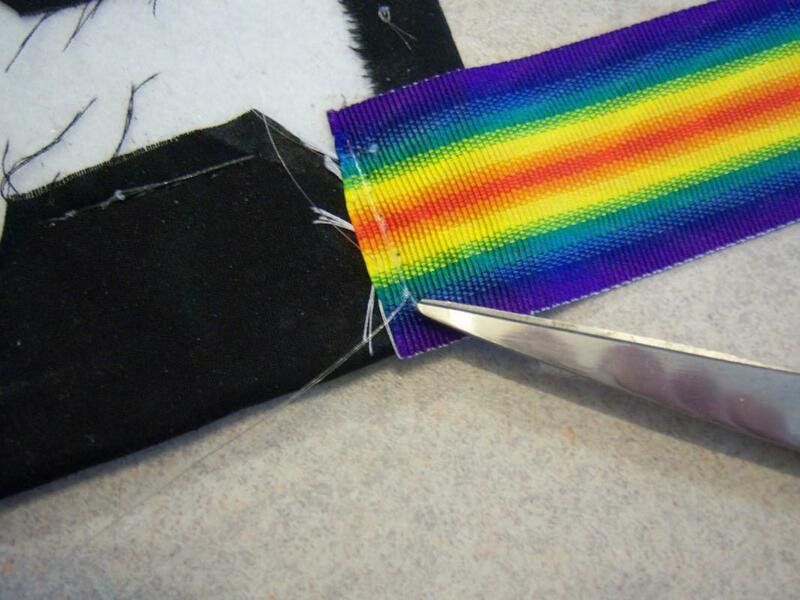 This is important because you will be stitching the ribbon as well as gluing it down. Do NOT glue the ribbon to the front of the base. Glue has a habit of bleeding through ribbons so the less you use the better. Later on you’ll see that this can’t always be avoided and you have to trust that the glue you have selected will not bleed through and show on the front of the ribbon. Again as you can see I have used the clamps. The only reason I used glue at this stage is that I find it holds the ribbon in place while stitching. My hands are better suited to cabinet making than tailoring. 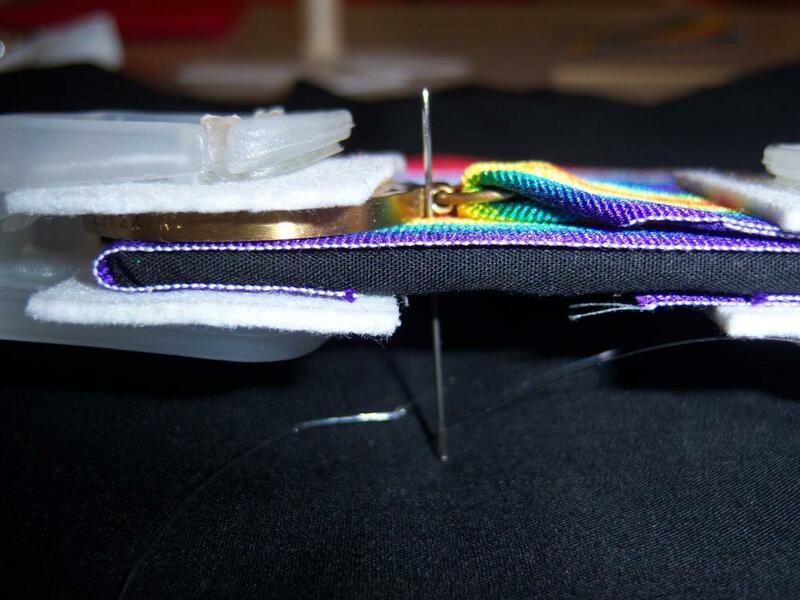 Once the glue has set you can start the sewing. Fold the ribbon so that you are not stitching the front of the ribbon to the base while stitching the ribbon on the back of the base. 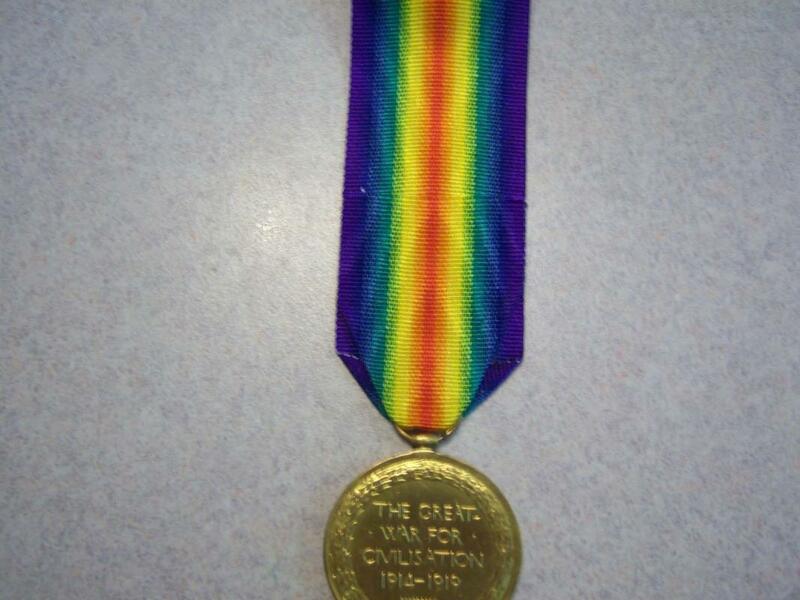 Again this is important at this stage as the front of the ribbon, under the medal (when we get that far) will show. I always put in a “tack stitch” on one side of the ribbon just to help hold it in place then start to sew from the other side. See the photos below for how it should look. The next step is to attach the top of the ribbon to the base. Make sure you keep the ribbon square to the edge and firmly pull it straight. Apply glue to the base under where the ribbon will go and also on the back of the ribbon. Press them together and clamp, if you have clamps; otherwise put some weight on the ribbon while the glue is setting up a bit. 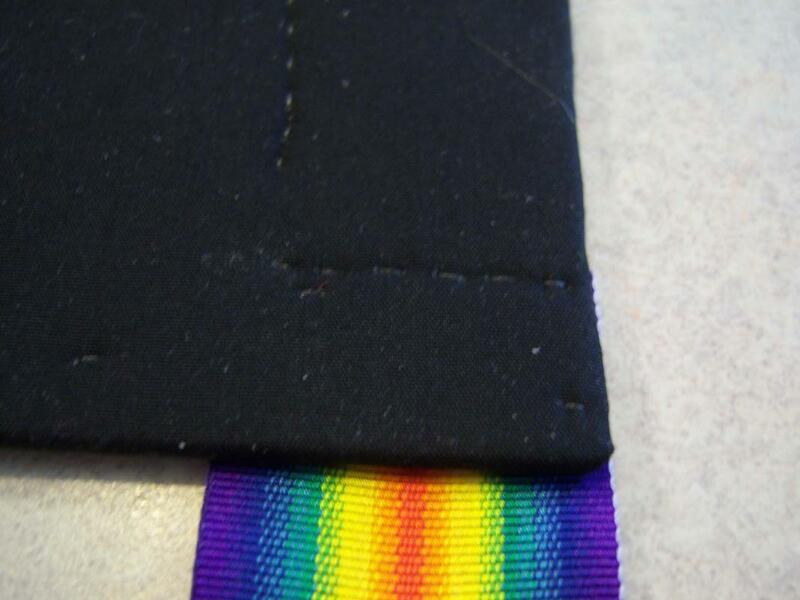 This time you will be sewing through the front of the ribbon (still starting from the back) but this is not a problem because the ribbon that holds the medal will cover this area, so these stitches will not show. Repeat this process with the other two ribbons and set the project aside so that all of the glue has time to set up completely. I’ve attempted to mount up groups all in one evening and found that the mount and ribbons start to feel damp to the touch indicating that I should have show a lot more patience. 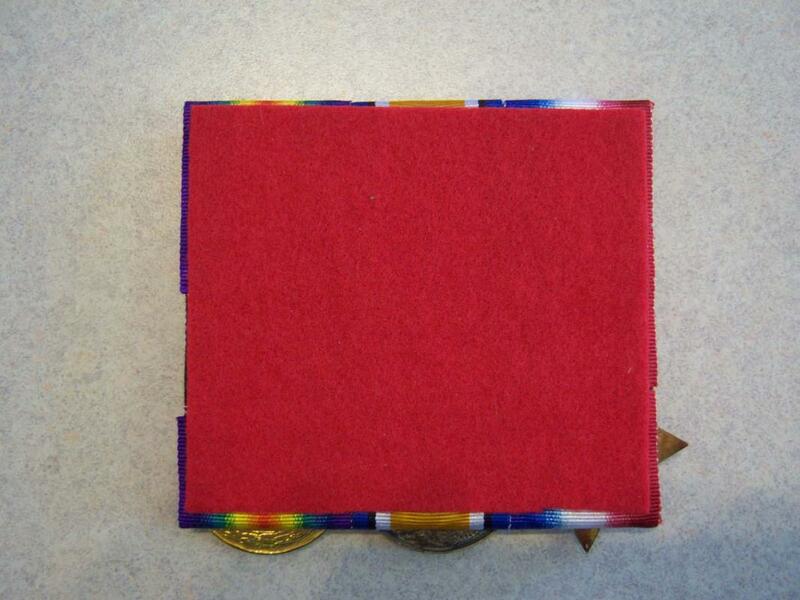 I’ll show the finished base ready for the medals and their ribbons in the next post. Here we have the finished base for your medal group. 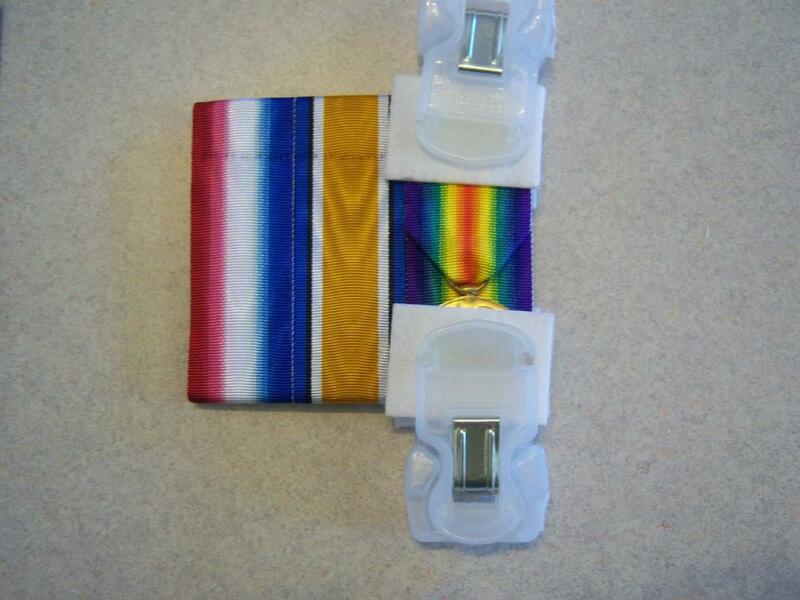 Next we will need to attach the medals themselves and their ribbons. It may seem that I do a lot more sewing than I need to and perhaps you would be correct. However, this is not a race and I enjoy taking a soldier’s medals that have been neglected in a drawer for nearly 100 years and giving them new life. My wife thinks I am mad as she could sew this up in a couple of minutes on one of her machines. She is quite proficient at sewing and has several sewing machines to make everything from dolls to quilts. I appreciate the offer but would rather do this by hand myself. Just like a school boy’s project assignment, you can always tell when he has had parental assistance. As you can see from my sewing this is all me. I’ll let this completed base “rest” over night so the glue sets up. It is always best to press the base at this stage under some weight to make sure it completely dries and remains flat. I have an actual press for this but you can use any flat heavy object. We’re just about to star to mount your medals on the base, but before we continue on with that there are a couple of things to go over. These final stages are the most critical for a nice mount and, needless to say, can be the most frustrating, so proceed as calmly as possible. In the case of the trio I am using we have two of the medals with rings and only one with a straight bar. The straight bars are the easiest to mount because the rings require the ribbon to be shaped into a “V” where it passes through the ring. 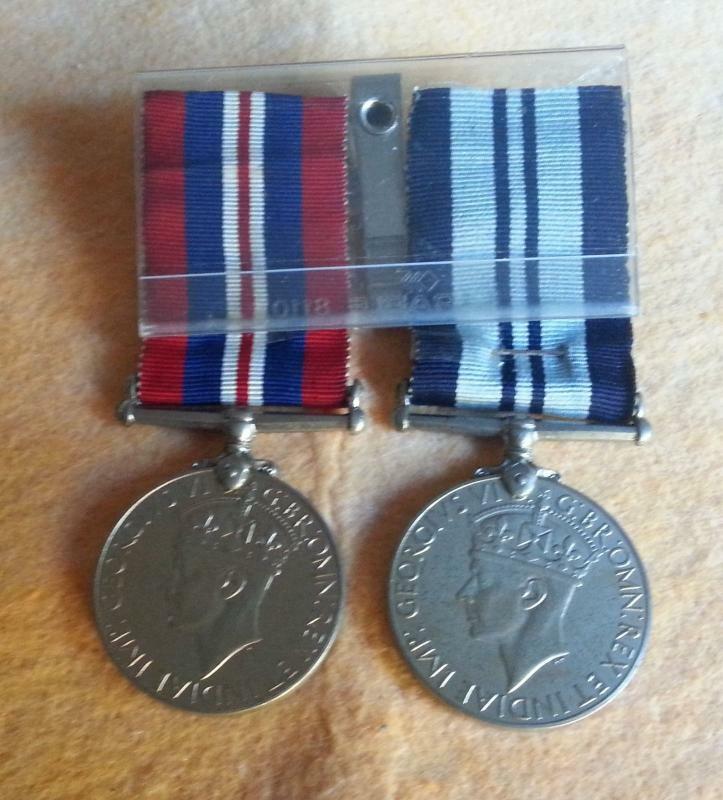 When you are working with only one “ring” suspension you only need to worry about the two sides of the “V” being even; but with two medals with ring suspension both ribbons need to look as close to being the same as possible. 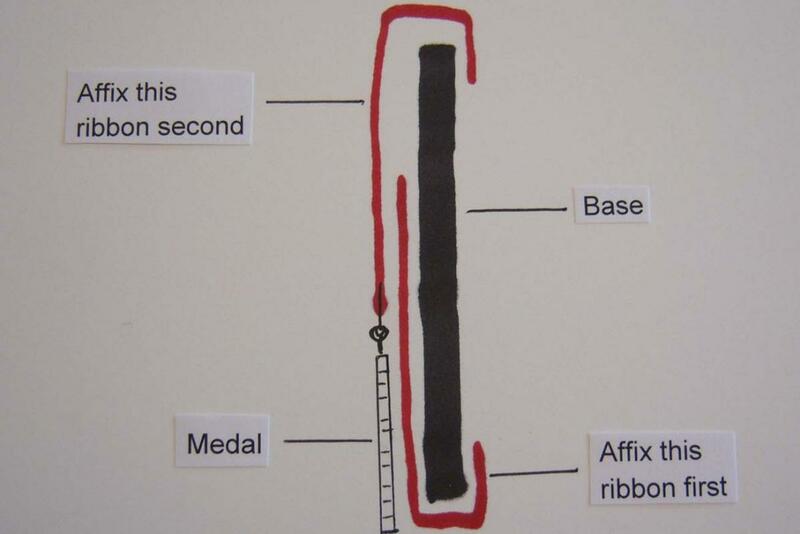 I’ve made a rather crude drawing to show what we are basically going to be doing with the ribbons. 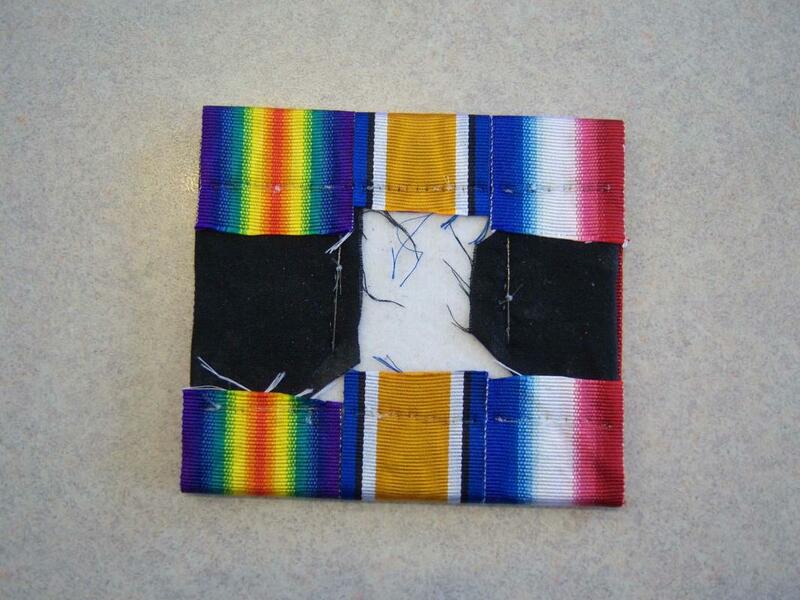 The section of ribbon just above the medal and closest to the base in the drawing is affixed first using glue and stitches. The front of the ribbon goes over the top of the base and is only glued in place on the back of the base as stitches would show on the front of the ribbon mount and you do not want that. As we proceed all of this will, I trust, become clearer. I’ll also discuss the way to fold the ribbon in a “V” for mounting the ring suspension. Please note the drawing is a side view and is nowhere near to being in scale; it’s just a representation of how the mounting ribbon will be positioned. 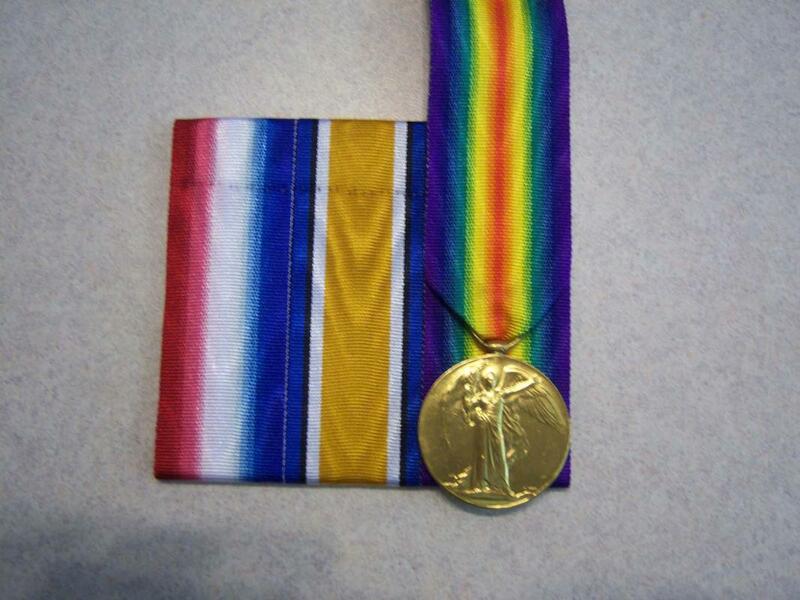 Also as a note on the positioning of the medal, the bottom of the medal protrudes beyond the ribbon base. 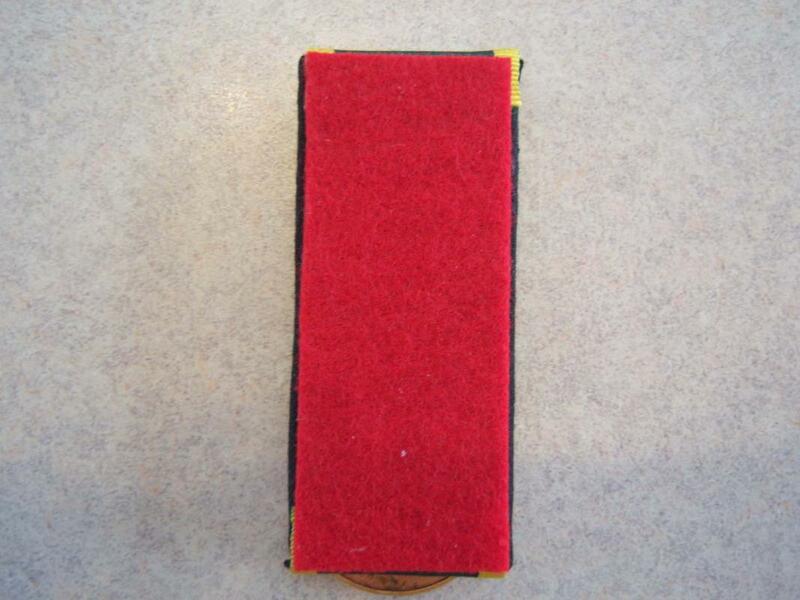 Some people argue that the ribbon should show below the medal but regulations dictate the medal goes beyond the ribbon at the bottom. You will see this as we proceed. To mount the medals start with the medal to your right, in this case the Victory Medal. 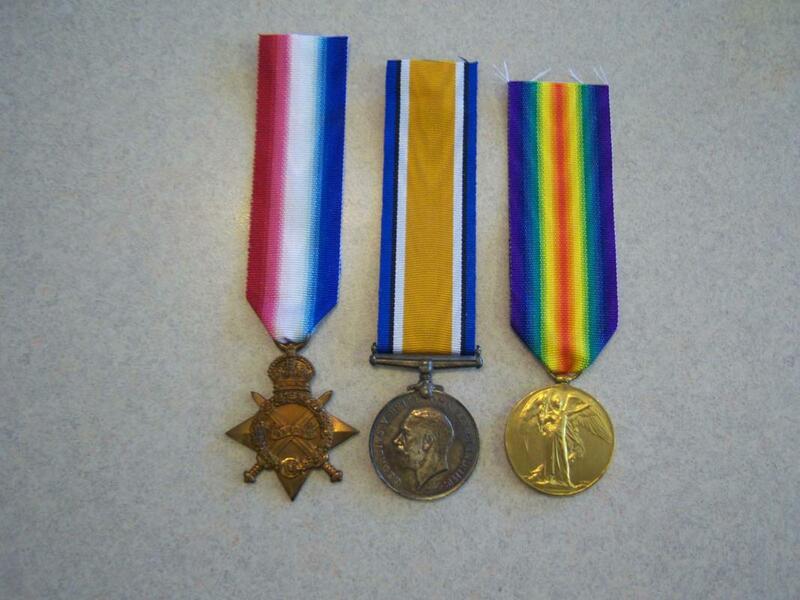 I think the WWI Trio is one of the most difficult groups to mount as not only is the Victory Medal wider than the other two but neither of the two rings is the same size. This can get frustrating but stay with it; it will all work out in the end. 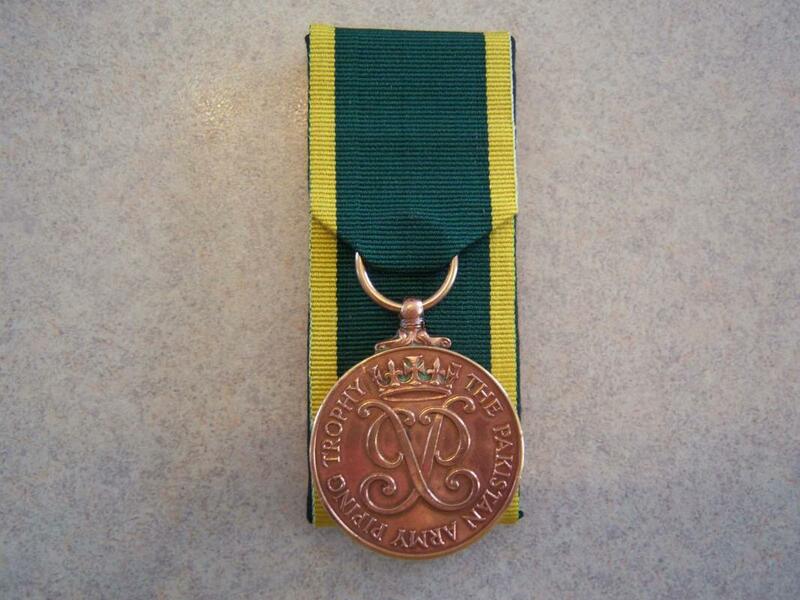 The medal will be mounted with a bit of the edge protruding beyond the base so hold the medal where you want it and then fold the ribbon crosswise as if you were going to mount a straight bar (don’t worry about the ring mount at this time). You should have about two inches that will be attached to the front of the base and 4 inches than will go over the top and be fastened to the back of the base. Don’t worry about being exact just make sure the ribbon that will be fastened to the front of the base is not so long as it will want to go over the top of the mount. 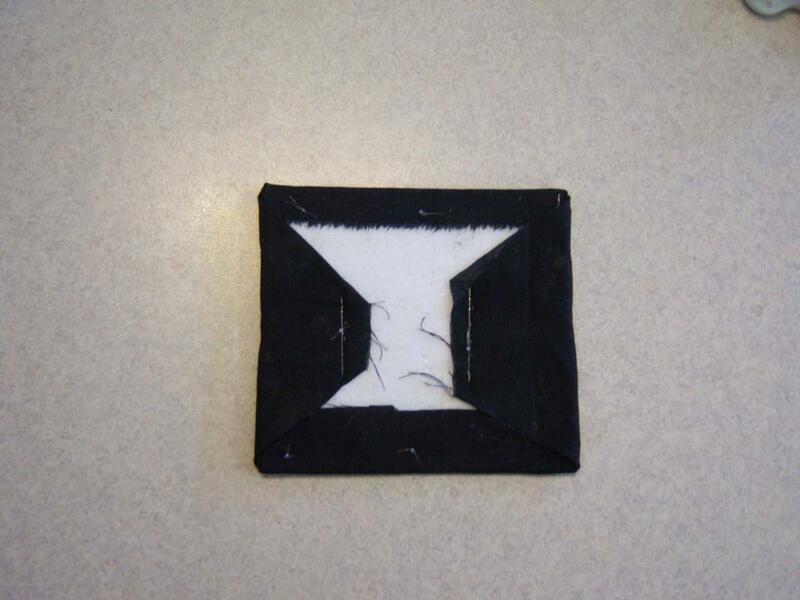 Next make a fold, as shown in the photo below, on one side and then the other making sure they are the same angle. It is alright and perhaps preferable if the back edge of the fold is smaller than the front; I think this shows up well enough in the photo. Now put some weight on this folded section and let it sit for a while. I would not suggest using a steam iron to press the fold as I have had the colours in some ribbons “run” when the wet steam hits them. 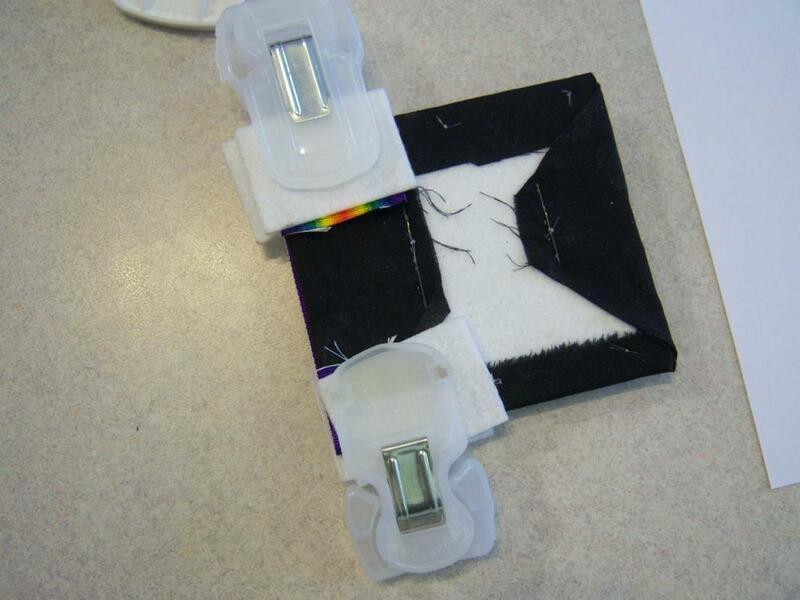 The other problem is that any folded material under the ribbon will telegraph through and will be seen on the front of the mount. 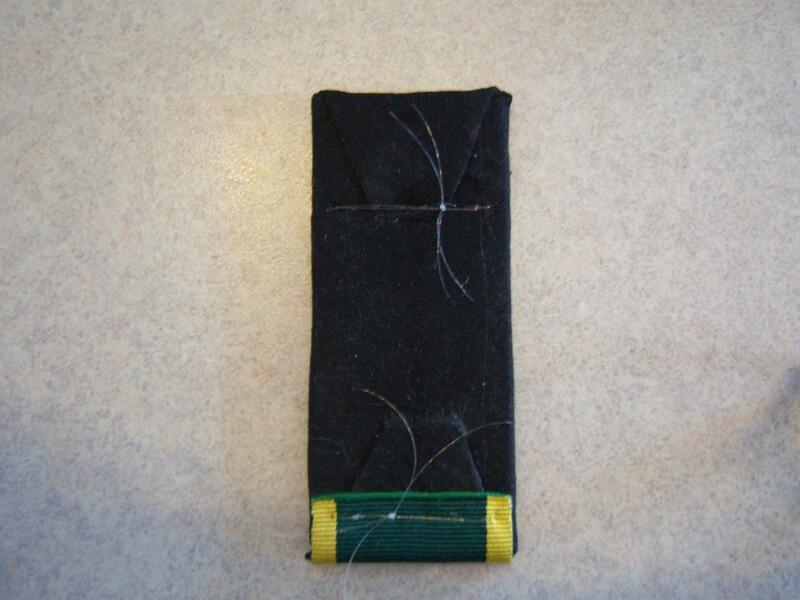 The next photo shows the ribbon from the back and how the angle on the back part of the ribbon keeps it out of the way from being seen from the front. The second photo below shows this properly aligned and glued in place. As you can see from the front view the only angle you can see is the front part of the ribbon. 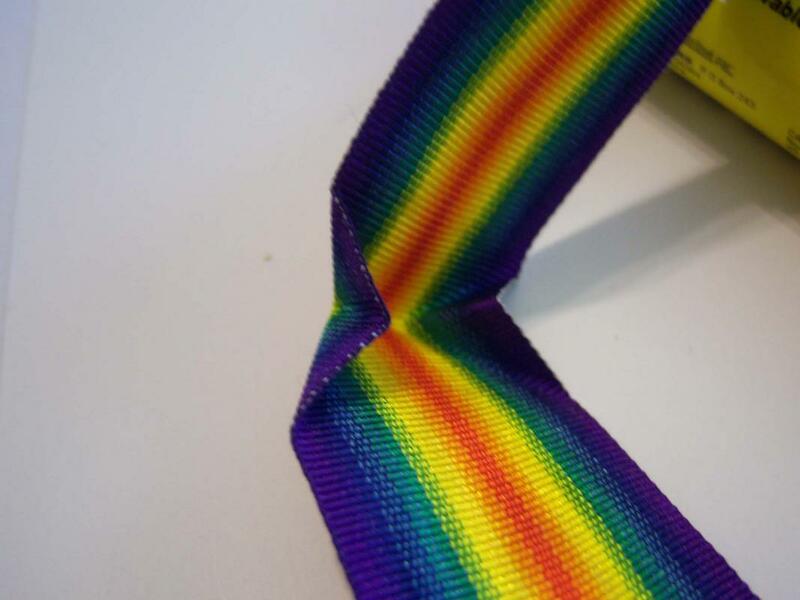 Don’t attempt to get both the front and rear angle of this ribbon exactly the same as it is almost impossible and it will also make this area look too thick. Some people cut the ribbon on the back where the two folded over sections meet and this is not a bad idea as the ribbon lays down better. However, I don’t like that look, preferring instead that it looks a bit fuller where it comes through the mounting ring; of course that up to you. 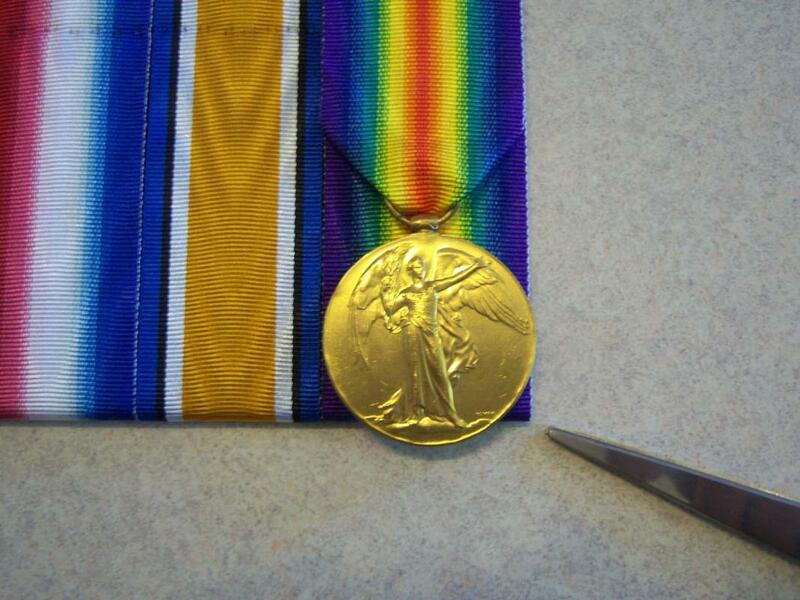 I’ve placed the Victory Medal and ribbon on the base so you can see what it will look like when we mount it. I would suggest that you place some weight on the glued area of the ribbon over night just so the glue is set up completely before you attempt to do the final mount. I used the small home-made clamps to hold the glue-up right after taking the photo below. You can now move on to the other two medals and get them ready to be mounted once the glue sets up. 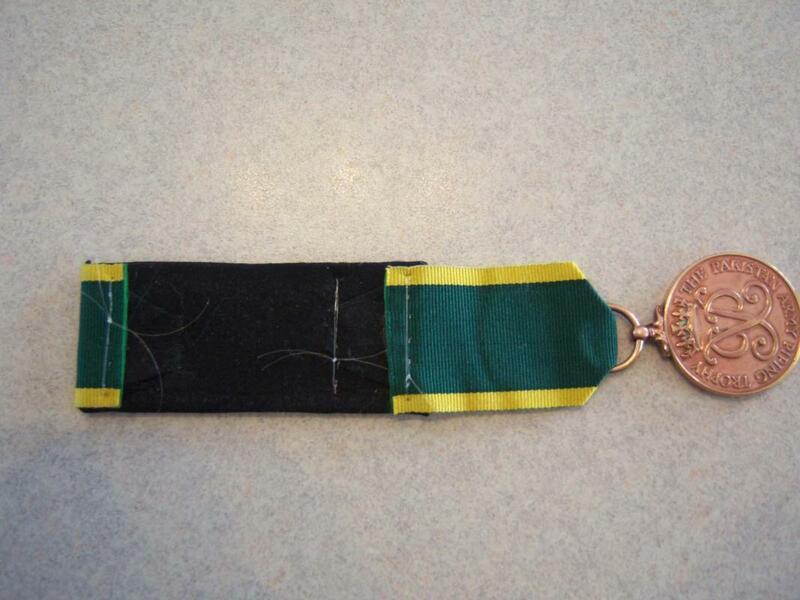 The three medals having sat over night with weight on the glued ribbons and should look like the photo below. Earlier I said that I didn’t like to use a lot of glue and that was true at that stage. The stitches that were put in base helps to stiffen the base and at that point, if you use too much glue, it takes a long time for the glue to cure (dry). At the point we now find ourselves it is my opinion that gluing is the best approach; just don’t put the glue on too thick. We are now ready to mount the medals to the base. 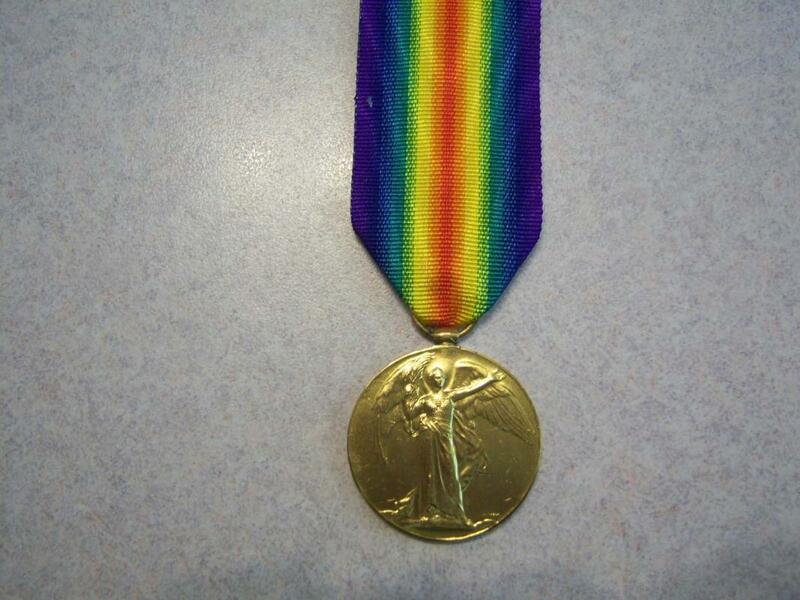 First position the medal so that it protrudes just a little beyond the bottom of the base. The photo shows the position indicated by the tip of the scissors. Next you will need to hold the medal in place. I like to use the clamps I made but if you don’t have anything such as this then holding them by hand will do the job. Just remember that you need to be careful not to leave finger prints on the medals, especially the silver medals by touching them with bare hands. I have also clamped the ribbon in place just to keep it out of the way for the next step (sewing the medal to the base). From the back and using the 6 lb. clear fishing line on a needle you will need to push the needle through and as close as possible to the suspension device that is affixed to the medal. Then return the needle front to back to make the stitch. I always do this twice to really secure the medal to the backing board, but once is probably enough. Now tie the line using no less than three knots to assure that it will say tied. Leave some extra length on the line when you cut it free from the needle as this will be glued down later and will help to secure it even better. Now glue the ribbon to the base. You can glue the ribbon to the front of the base, above the medal as well as on the back of the base board if you like, that is up to you. 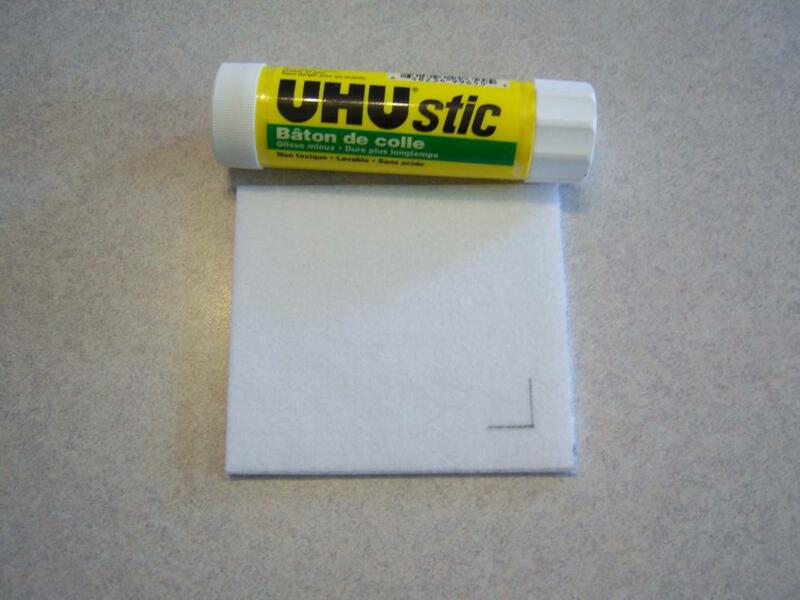 I tend to like the glue in both areas, just be sure you never use glue that will bleed through. The instant dry epoxy glue called “Crazy Glue” is NOT for projects like this as the “bleed through” is immediate and will ruin all of your work. You will need to leave this to dry for at least a couple of hours to be safe; If you would rather go faster, sew all of the medals on the board first and then do all of the gluing at once and leave it under weights overnight. In the photo below I have used clamps to hold the singe ribbon. 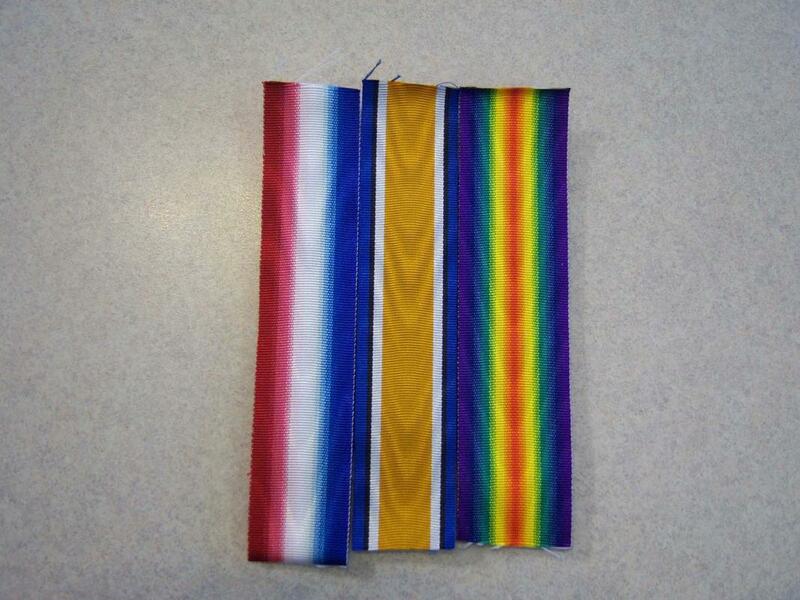 In order to make sure the bottoms of the medals protrude past the base ribbons here is a trick that might help you. Use a piece of graph paper and align the edge of the mount to a horizontal line. Now slide the mount down until the medal touches a horizontal line and make sure all of the rest of the medals are mounted to this line. Next you need to apply a piece of material to the back to protect the ends of the ribbons and to also make the area look neat and tidy. I have seen everything imaginable (within reason) used for the back; including, leather, black broad cloth, a thick piece of wood (balsa wood I believe) and even green duct tape. I like to use red felt. If you end up mounting quite a few groups this can almost become a trade mark of your work. Just remember to let the glue, under pressure, have time to cure, or dry after each step. of the soldier’s papers and several photos of him and his fellow soldiers in a couple of different regiments. Below is the three items out of the many artifacts that came with this trio that I will display in the main collection. The balance of the paperwork, container and envelope for the memorial plaque along with other documentation will be stored in my archives filing cabinets. 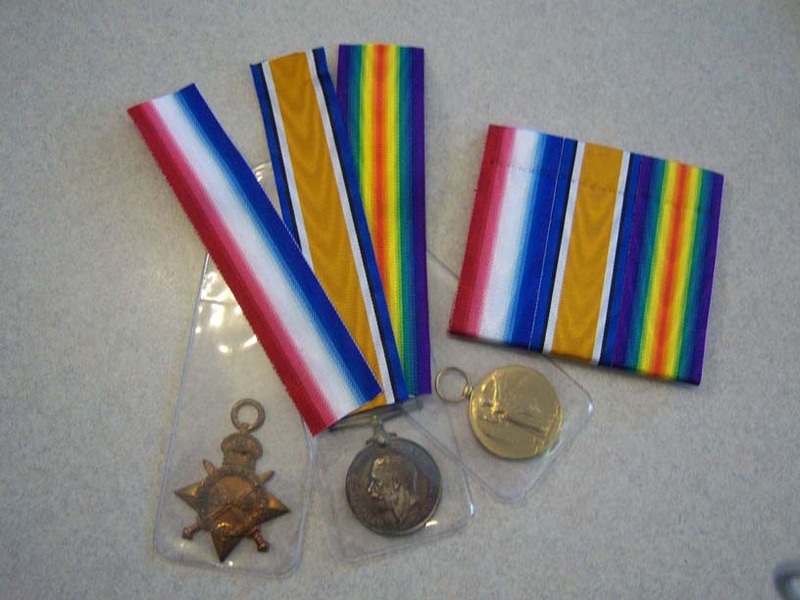 This group of medals and supporting documents along with those of his brother-in-law, a pilot in the RFC were on their way to the landfill as garbage. The material regarding the pilot has photos, his records and pilot’s license along with many other documents. He joined very early in the war and therefore was one of the first RFC pilots. Surviving the war he worked in aircraft design as an aeronautics engineer throughout WW II and beyond until he retired. This material includes family photos and even passports. So in this case the historical account of these two men would have been now beneath dozens of feet of rotting garbage. To my way of thinking, what better way of honouring a service man that to court mount his medals and preserve these artifacts for future generations. I hope my long tutorial, and sermon at the end, will encourage you to attempt court mounting groups of medals yourself. Thanks for taking the time to read my submission. Great tutorial and an impressive result. It looks awesome. One question: Is this "how it's done"? I mean, if I found a professionally mounted group and took it apart (no, I have no plans of doing so...) is this what I would see? Or is this your own recipe? Clearly, the result looks great. You did this man's service a real honor by doing this act of love. I cannot wait to see the other set you rescued. I want to redo this set in this sort of mount and was looking for a step by step tutorial and then I find this... It seems like a complicated process... but it is worth it. Thanks for your comment. Most of the process is my own design and along the way I've studied other's work and started using glue more often as the final results were better than just sewing. I probably spend more time and effort on the base than necessary but no doubt due to one of my past professions (designing and building homes) I believe that if the base is not sound then the finished product will not be up to par either. Thanks Paul,I appreciate your comments. I started out court mounting Indian medal groups, a lot being in pairs much like your example. The straight bar suspension madals are perfect for a first time project. The whole process is a lot easier than the tutorial would seem to make it. I was suprised at just how complicated it seemed when I read the final draft yet sitting down and doing the work never seemed to be that much of a deal. I hope you will give this a try and if you do I am sure you will be surprised at just how good it looks when finished. Not surre how I missed this. Very interesting. 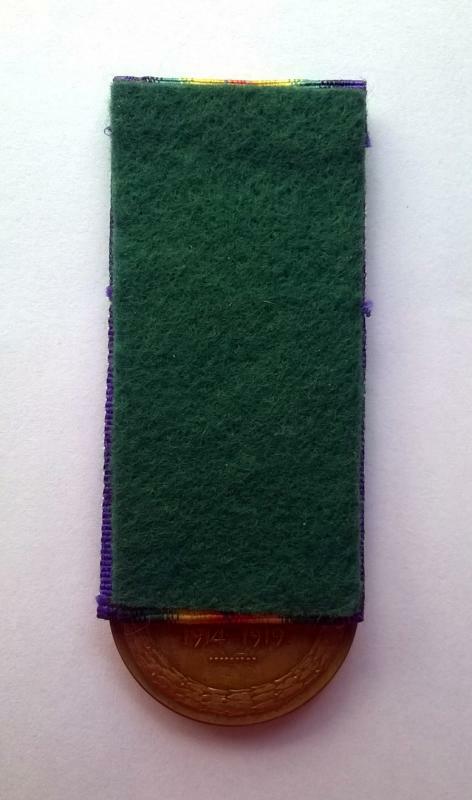 Another method of court mounting medals found with some Indian and Pakistani medals, especially of the 1960s and 70s, is covered briefly below. 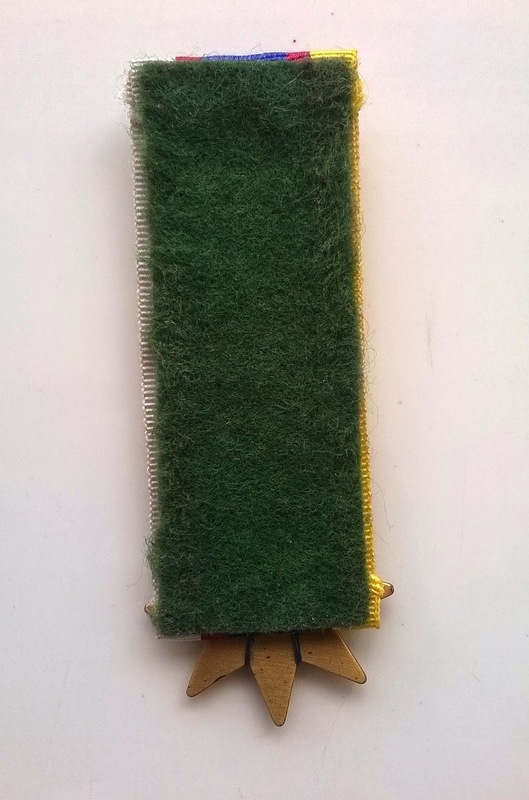 This method works best if the back board is 3 inches rather than the British regulation 3½ inch long board. 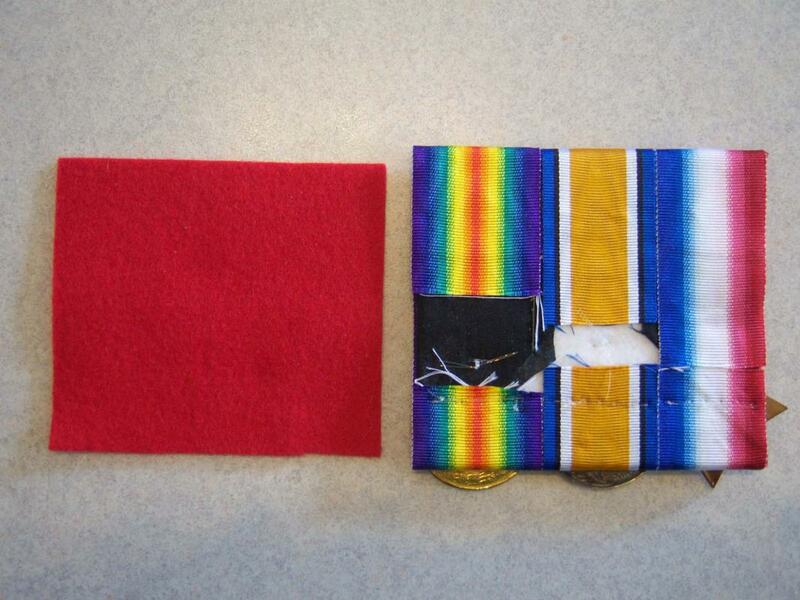 I have several medals and groups from India and Pakistan using this method, which I suspect was developed in order to conserve on the cost of ribbon. Since I had a single Pakistan Army Piper’s Trophy Medal on hand I decided to mount it up as an example. I’ll post the medal in the appropriate section with more description later. 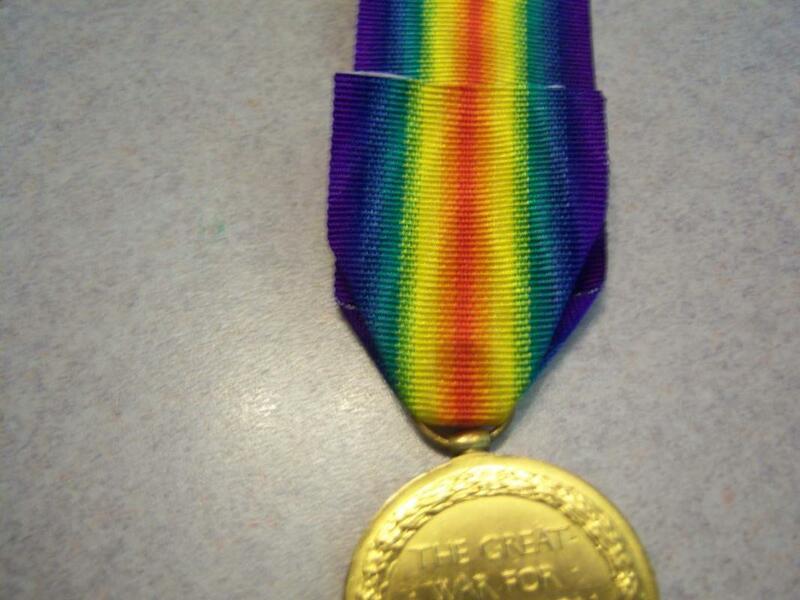 So far I have not been able to verify the ribbon as correct even though it was supplied with the medal. 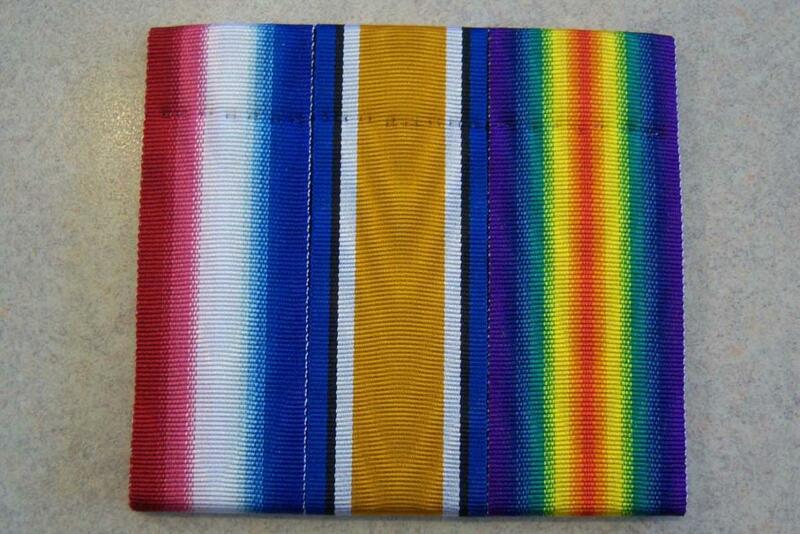 This ribbon is the same as the British Territorial Medal’s ribbon, while possible, it still needs verification. 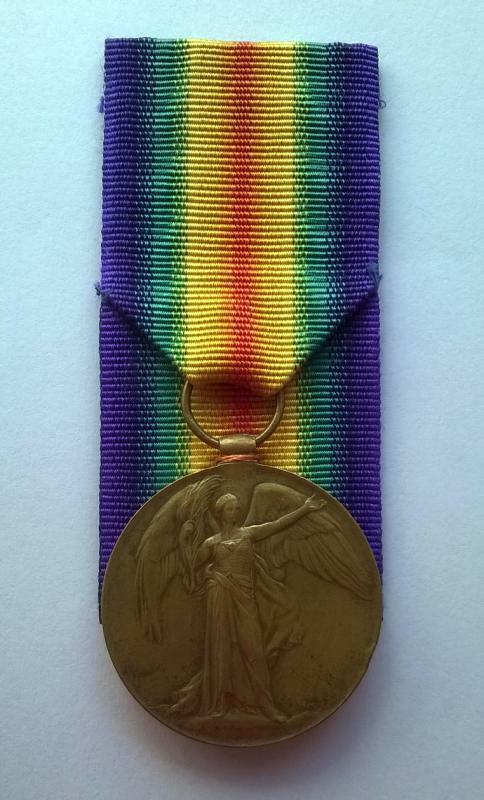 If anyone has information regarding this medal’s ribbon I would appreciate hearing from you. 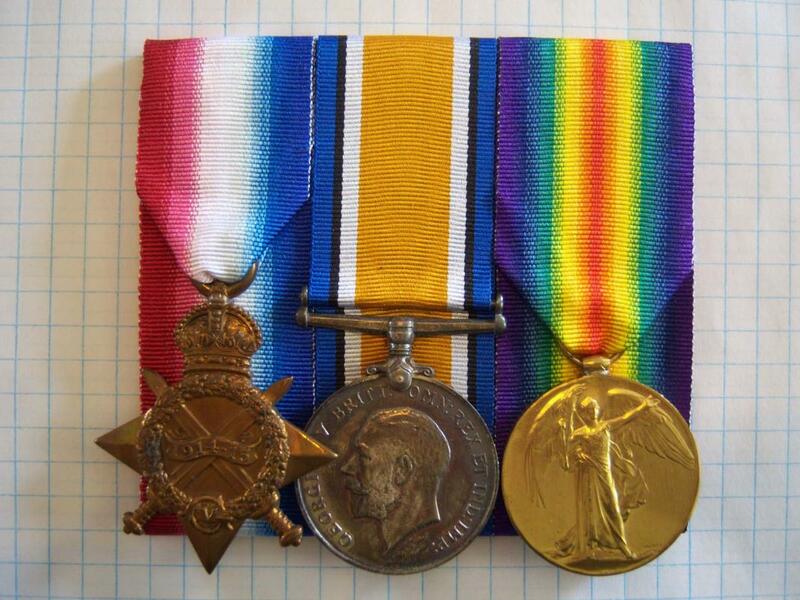 My reason for including this method is that you may encounter a single or group of medals, which may include British medals from WWII, using this method and decide that the mount is in such poor condition to require re-mounting. If you are anything like me you’ll want to preserve the integrity of the original and employ the same approach to court mounting. Sometimes good preservation and conservation requires repairs and, in my opinion, the item should be brought back to as close as possible to its original condition. Attach the bottom of the first ribbon first so that when you bring it around to the front the stitches do not show. Next sew the ribbon to the backing board. These stitches will show on the front of the mount but will be covered by the second ribbon. Next the second or top ribbon is affixed by sewing the top of the ribbon so that the stitches will not show once the ribbon is brought around to the front as shown in the drawing and in the photos below. 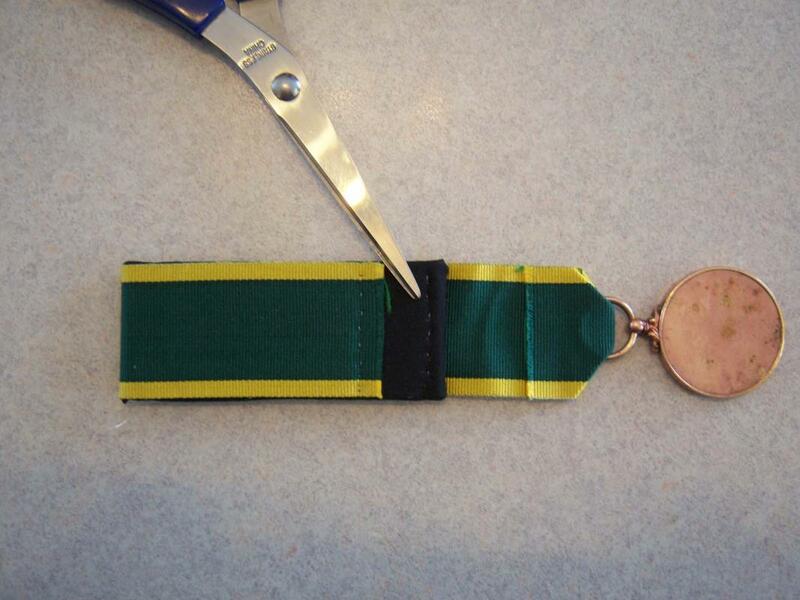 You will notice that the medal is already attached to the ribbon; this is the best time to do this when using this method of mounting. Following the same procedures for the red felt back as in the initial portion of this tutorial you should have something that looks like the photos below. If you would like to try either or both of these methods and need more information please do not hesitate to contact me through a PM. Good luck and happy mounting. Just one question, is there a reason that his shield on the finished framed mounting has PTE? On the photo he seems to be wearing Lance Bombadier stripes. A question that I can't answer. 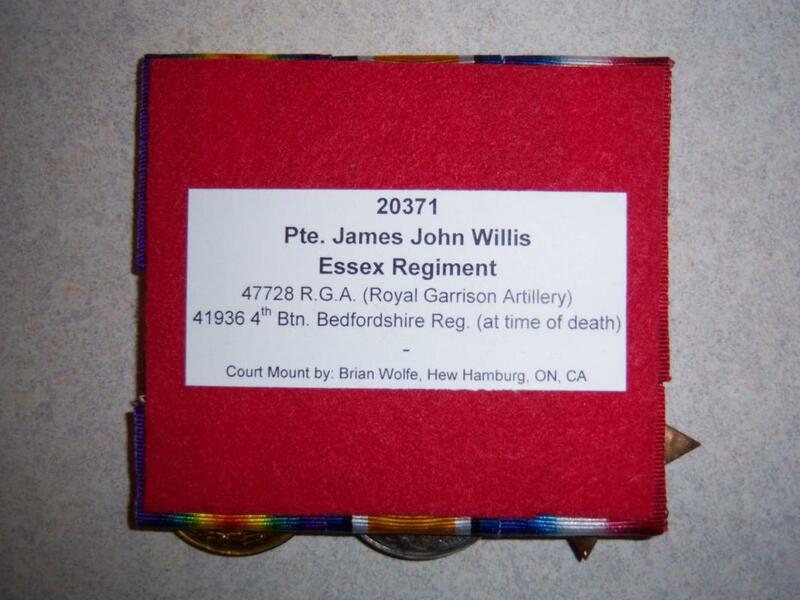 All of the documentation on him has him as a Gunner with the RGA then Private in both the Bedfordshire and Essex. 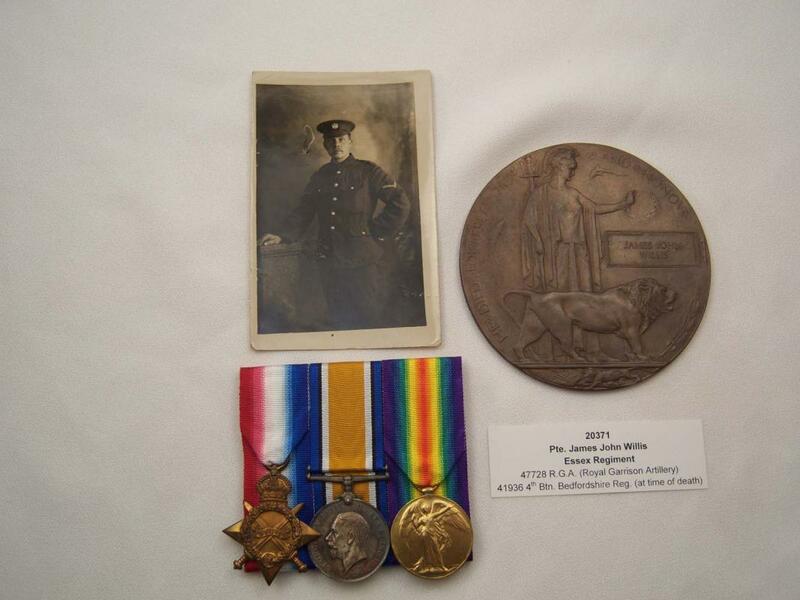 I have a photo of him in the RGA and one with him with a group of both RGA and Essex. Process of elimination points to which soldier he is in the photos. There is a possibility that the photos were of other soldiers, however I think that is slim considering I got this straight from the famil and there is not a lot of random photos of different soldiers (all photos in their posession have this fellow in them). Sorry I can't answer your question. Thanks for your comment Larry. I'm glad you didn't miss the article. This is an example inspired by his work. I liked the result. Thank you. Excellent job on the mounting, well done. Another medal mounted unfortunately do not have BWM, so I decided to value only a medal. Well done and a fitting tribute to a brave soldier. Thanks for showing your excellent work.